1 – Where did you think the treasure was while you were reading? Did you think it existed? Would you follow visions and innuendos form others to find your “treasure”? 2 – Did you like the style of writing? Why or why not? Did you like the line between reality and the supernatural? 3 – Did you notice the circular theme? Santiago ended up where he started o find the treasure? Do you think he will return to Fatima and complete another circle? The Guardian: For anyone who reads not only to escape reality but also to understand reality, The Alchemist can offer the best of both worlds. The events of the novel sit just on the borderline of miraculous and the ambience is simply just not that of our humdrum teenage world. 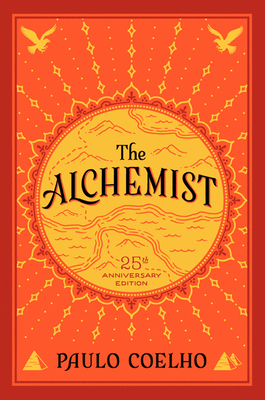 However, The Alchemist also supplies insight and inspiration that extends beyond Santiago’s Sahara and into all lives, whether young, old, or teenage. The Alchemist may not be your regular YA fiction book, but it most definitely still deserves a place on your bookshelf! Publishers Weekly: The story has the comic charm, dramatic tension and psychological intensity of a fairy tale, but it’s full of specific wisdom as well, about becoming self-empowered, overcoming depression, and believing in dreams. The cumulative effect is like hearing a wonderful bedtime story from an inspirational psychiatrist.